Tuma mi Man is a childcare center, but not just an ordinary one. Besides 55 regular child places, we also provide 25 free child places to less privileged children living in the neighborhoods of Parera (Curaҫao) which include nutrition, education, and family guidance at no cost. Our services include preschool and afterschool facilities. Children from 6 weeks to 12 years are provided with a well-resourced learning environment and skilled, caring staff who ensure the highest degree of care and education to the children. Fundashon Tuma mi Man believes that all children have the right to develop themselves to their full potential, ensuring each of them of a bright future. When parents do not have the means or abilities to provide the child with good care and education, the society is partly responsible to make sure that the child will be granted a fair chance at life. Our aim is to improve the quality of life of the children of our society, to offer support for their families, and the advancement of the Human Capital of Curaҫao. The caregivers are all skilled, loving & caring. Tuma mi Man’s care takers are all qualified with an SPW 4 degree and/or equivalent degree in child development or early childhood education. The instruction language at Tuma mi Man is Dutch, but children from all backgrounds are welcome. In Curaçao Dutch, Papiamentu and English are all recognized as instruction languages for educational purposes. 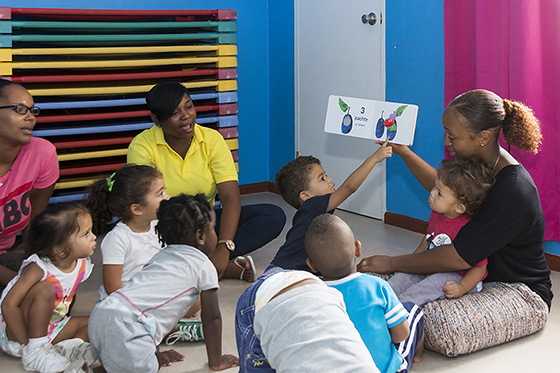 Since Dutch is the official business language in Curacao, Tuma Mi Man uses Dutch as the official instructional language at the day care centre. Papiamento, English and Spanish are approached as being a developmental skill. In addition to Dutch all of caregivers speak a combination of Papiamentu, English, and Spanish and can easily communicate and accommodate all children who do not speak Dutch at home. Children who are non-native Dutch speakers and who speak another language at home will receive special attention with regard to the development of their Dutch language skills, so as to facilitate their progress when starting primary school. Many studies have shown that multilingualism has numerous advantages. Through play & songs the different languages are taught. We want to let children know that the new language is useful. For example, speaking English will allow him to have new friends to go out with when you travel to America. At Tuma mi Man we make learning a new language a fun activity, something enjoyable.